Craig-y-Mwyn lies in the community of Llanrhaeadr-ym-mochnant in the county of Powys. It is located at Ordnance Survey national grid reference SJ07422852. The mine is recorded in the CPAT Historic Environment Record as number 8438 and this number should be quoted in all correspondence. Ordovician Llangynog formation shales, slates and tuffs. There are 2 ENE-WSW veins & 2 E-W veins. Mineralisation includes galena and sphalerite in a dominantly calcite, quartz and barytes gangue. There are extensive hushing earthworks on top of the hill SJ07472848 with 2 semi-circular dams close to the rim of the main opencast and numerous leats contouring the hillside from a bog source and exiting into the quarry like opencast. 'Miners Pools' are indicated on a plan of 1855 and are almost certainly other hushing dams or water collection ponds. The latter are now lost in an extremely wet boggy area at SJ07562810 and only one was recorded on the brief site visit. Aerial photographs show three small rectangular pools with associated leats which appear to exit into the quarry opencast at a more easterly location. There are a number of linear trial trenches on top of the hill north-west of the opencast at SJ07202870. There are eight visible levels, a shaft to the south of the opencast on top of the hill at SJ07352830, a deep adit to the east below the opencast, some open stoping within the opencast itself and numerous shallow trials around the rim of the opencast. Below the opencast the hushing activity has formed a very large fan of debris which extends all the way to the dressing floors. There is a tramway running from the No.1 level to the bottom of the opencast. A steep incline runs downhill from just east of the No.4 level to the dressing floors SJ07632860. On the 1885 plan of the mine a trough like ore chute was in use in the same position as the later incline. The incline has been cut through by a recent farm track revealing a section of its construction. A leat at SJ07712885 contours the base of the hillside to the north of the dressing floors and runs south into a storage reservoir for powering processing machinery at SJ07762879. The leat was fed by the Afon Disgynfa and Nant Y Gaseg. There are at least 4 leats on top of the hill feeding the hushing dams. The leats originate from bog sources at SJ07402817 & SJ07372857. A 30x4 ft diameter waterwheel drove the crushers. An incline winding house is situated at the head of the incline SJ07602861 with remains of the iron fixing bolts for the winding gear in situ. Part of a four foot diameter cast iron wheel, probably belonging to the winding wheel, can be seen alongside the incline trackway. 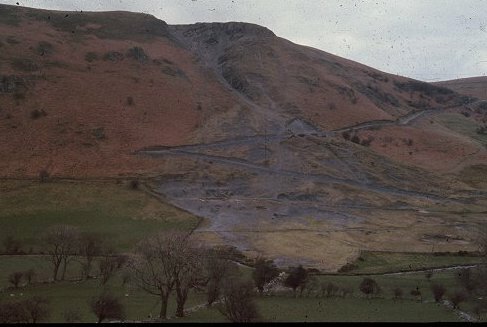 A stone breaker and crusher were situated close to the reservoir at the base of the incline at SJ07732878. The crusher house wheelpit and crusher housing survive. Stone platforms and walls to the south of the crusher probably represent the bases of a picking table and jigger bases. Round buddles and ore bins were also present but are not now identifiable on the ground. There is a magazine above the dressing floor reservoir at SJ07752880. There is a possible small mine office/smithy at the entrance to the smithy level. Workshops are situated to the SE of the dressing floors with stables and miners' cottages further to the east. At the western extreme of the opencast there is a rectangular building divided into a number of rooms which may relate to the eighteenth century activity at the mine. The building survives at foundation level only at SJ07432853. Another rectangular building with southern and eastern square room extensions can be seen 100 yards to the south of the opencast alongside the present trackway at SJ07452834. This structure may have agricultural origins rather than an association with the mine.